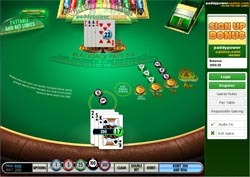 The dealer stands on all 17s in this game of Hot Streak Blackjack. You may double down on any two cards, even after a split. Splitting is allowed, but you cannot re-split. Split aces are treated just like any other split card (but you cannot get blackjack on split aces). A six-card player hand whose value does not exceed 21 beats all dealer outcomes except for dealer blackjack. Insurance bets are available, but there is no option to surrender. The special rule is as follows: for an additional side bet, you enable Hot Streak mode. Two or more consecutive (up to 4) wins earn you a multiplier bonus on your side bet. If you lose a hand during a Hot Streak, you are paid out at the last level you attained. All of WagerWorks Blackjack games look quite good – the graphics are crisp and clean, with a good level of realism. At first appearance, though, they all seem to be identical. The differences, however, come in when you start using the special features – in this case, the Hot Streak feature. Everything is made visual so you can easily see how your bet is doing. As you work your way up the ladder, your chips multiply to show you how much you have won. They also get animated with an awesome flame effect! It is little touches like these that make WagerWorks games look so good. Plus, they’re easy to learn and play, which makes them fit for anyone! Don’t forget that you can play on split dces in Hot Streak Blackjack, it’s a powerful rule variation, and even though it doesn’t come up very often, it is helpful when it does. Also, enjoy the HotStreak feature! Hot Streak Blackjack is great for several reasons. First, it’s basically your Classic Blackjack game, with the added bonus of being able to play normally on split aces. Plus, with the added Hot Streak feature, a small side bet can quickly multiply if you win a few hands in a row! All this comes in a wonderfully-made package that is easy on the eyes and is a real joy to play. This is a great blackjack game!